January 8, 2014 /3BL Media/ - Volkswagen Group South Africa was recently presented with the Chairman’s Award of Excellence for its Corporate Social Investment (CSI) programmes in the 2013 Investing in Future and Drivers of Change awards ceremony held in Illovo, Johannesburg. The Investing in Future and Drivers of Change awards ceremony was hosted by Mail & Guardian in partnership with Southern Africa Trust. The Drivers of Change award recognises individuals or organizations from across the Southern Africa Region that are making a real impact, especially in developing effective public policies and strategies, to overcome poverty. The Chairman’s Award of Excellence is presented to a CSI programme that has shown remarkable commitment to acting as a driver of change and investing in the future of the country. The citation from the judging panel stated that Volkswagen Group South Africa was chosen to receive the 2013 Chairman’s Award of Excellence because of its wide reach, holistic approach to Corporate Social Investment implementation and its strategic partnerships. It further added that Volkswagen Group South Africa’s multi-faceted CSI programme has managed to assist young and old in almost all sectors of the South African society. Volkswagen was a finalist in three categories in the 2013 awards. The categories were business, education and best corporate employee community involvement programme. “This award is the recognition of Volkswagen’s quest to be a company with the meaning and impact. It also embodies one of our company’s value of excellence which we always endeavour to bring to all our CSI projects. We have invested more than R100 million in different CSI projects ranging from education, youth development, enterprise development, environment, health and community wellbeing,” said Nonkqubela Maliza, Director: Corporate and Government Affairs at Volkswagen Group South Africa. “About 80% of our CSI spending is on education and youth. We took a conscious decision to align our spending with these social issues which are national priorities,” added Maliza. Volkswagen’s education and youth projects include Ikhwezi Lomso Pre-School; the KwaNobuhle loveLife Y centre, which we built from scratch, Edu-Peg, Masifunde, the Soccer Fun Bus and Adopt A School Maths & Sciecnce Programme. Volkswagen’s CSI strategy is about people. It’s about making life better for everyone, from individuals to communities, environment to enterprise. It’s not about fixing one part, but making sure all the parts work together so we can move forward together - Because people are at the heart of Volkswagen. 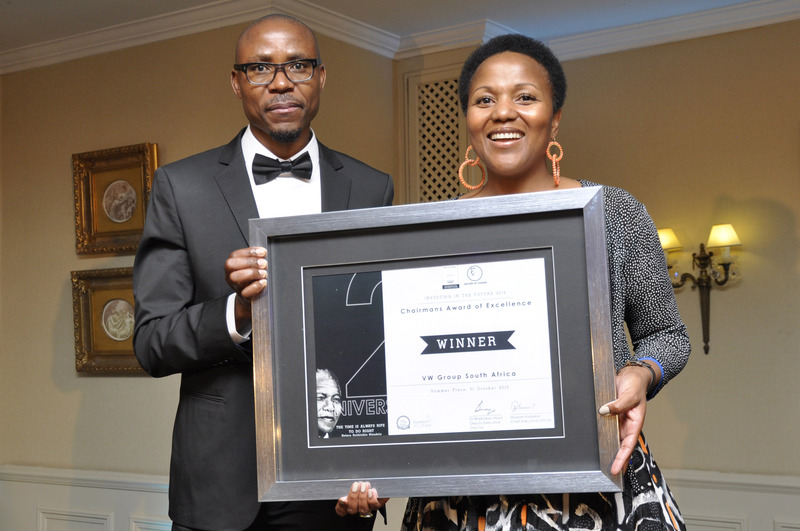 Accepting the award on behalf of the company is Nonkqubela Maliza (VWSA Director of Corporate and Government Affairs) with Bhekinkosi Moyo, Acting Executive Director of the Southern Africa Trust and member of the judging panel for the awards. Volkswagen Group of America Employees Give Back With Get Involved "Summer of Service"